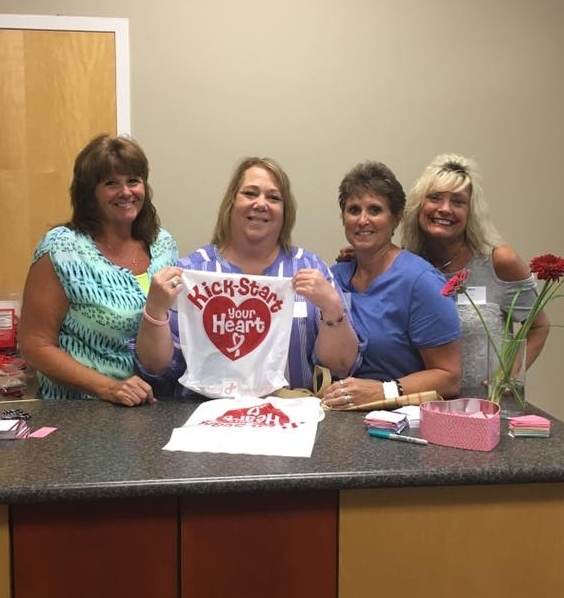 Thank you to Sara Robertson, heart mom to Hannah, for writing up this blog post about what she & a group of coworkers/friends do every year to volunteer for our organization. This group has been in charge of checking in all of the kids who attend the auction and distributing the kids bags that are full of activities to entertain them during the event. My name is Sara Robertson. I met Emily and Melissa while we were all at The University of Iowa Stead Family Children’s Hospital in Iowa City with our heart children. These amazing women later co-founded Help-A-Heart. I’m very glad to have these ladies in my life, even though I am not a fan of how our paths crossed. To this day, I continue to keep in touch and I absolutely love volunteering for this organization, mainly at their silent auction and dinner each June. I have gotten some of my friends whom I work with at Wellmark to volunteer the last couple of years. And to be honest, I think these friends will continue to volunteer for Help-A-Heart as they were so moved by the stories of the families that Help-A-Heart gives support to in monetary and emotional ways. My co-workers, Beth Steven, Darla Jergens and Tammy Newton, along with myself volunteer a lot for various non-profit organizations. Our employer, Wellmark, has a program called Blues Giving. For every 8 hours a employee volunteers for an approved organization, they will allow the employee to designate an organization to receive $250. Each employee has the opportunity to designate up to $10k a year by volunteering up to 240 hours a year. I know for my own reasons why Help-A-Heart is so wonderful and such a worthy cause. Now a few other co-workers have got to witness this as well. See you every June!